Do you have multiple XBMC clients and want an efficient but simple solution to keep track of watched status and bookmarks for multiple profiles. Do you want to scan once for all of your XBMC clients and profiles. Then this tutorial is for you. If you have any questions or problems please reply to this thread. PM's will not be replied to as they are not useful for the community. If you use these instructions please post a reply telling us how it went. 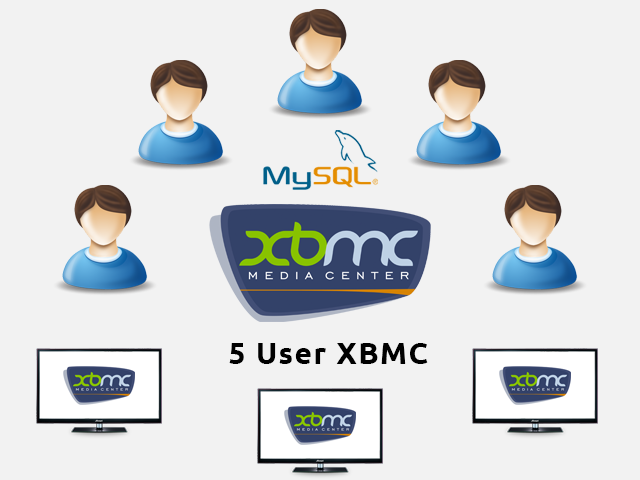 This tutorial will guide you through the process of creating 5 XBMC profiles which are all linked. Each profile has its own watched status and bookmarks. XBMC by itself is good for managing multiple profiles on a single client. XBMC with MySQL is good at managing a single profile on multiple clients. XBMC with MySQL and the following setup is good for managing multiple profiles on multiple clients. In my setup i have 6 clients with 5 databases. If i was to scan for each profile on every machine i would have to scan a total of 14 times. With this simple SQL magic i only need to scan once. It also gives me the added benefit of being able to pause a video in one room and continue watching in another. If i'm watching a season in one room i can go to another and continue where i was up to. But the main benefit of this setup is that me and my housemates can be watching the same videos whilst keeping separate watched status and bookmarks. This setup now supports video and music. For more info on my setup look at my showcase thread. If you need extra help installing MySQL or wish to use a operating system other then "Ubuntu 12.04 Desktop" please checkout the official wiki. NOTE: If you have a database already stored in MySQL you will first need to rename it to 'a78' then skip step 3a. Right click "Run as administrator"
Using your favourite SQL client (Terminal, phpMyAdmin or my personal favourite Sequel Pro) run the following query. If your having problems downloading the file, copy any paste this code directly into your SQL client. NOTE: You may leave extra users blank so they are not used on a certain client. Users can be in any order as long as the name matches the database. Very awesome! Thanks for posting this. Don't you have issues using named databases in advancedsettings.xml? I have read and experienced it myself that when using named databases it can give some issues. Therefor I'm using this method which also works and only has a single database. Hey, I have not experienced any problems with using named databases. Since my databases each have their own bookmarks table there is no need for different SQL logins or any other workaround. I use the single login for every client/profile. Just with the different databases. Also no triggers are necessary. Previous to using a78, b78, etc on 13 I had been using a75, b75 etc on 12.3 all the way back to a60, b60 which was version 11 i think with no problems. Its very easy to do an upgrade from a75, a78 for example. So each time i upgrade versions its a pinch. (2014-06-04, 19:13)deathraiider Wrote: Hey, I have not experienced any problems with using named databases. Since my databases each have their own bookmarks table there is no need for different SQL logins or any other workaround. I use the single login for every client/profile. Just with the different databases. Also no triggers are necessary. Okay, I'll give it a try. Master profile uses name A I presume? (2014-06-04, 19:48)schumi2004 Wrote: Okay, I'll give it a try. Master profile uses name A I presume? Yes, master is a78 which uses the name a. Although you can scan in from any user. Master just refers to the SQL structure where all data is stored except for the bookmarks table. Any plans to implement such for music? (2014-06-05, 12:11)schumi2004 Wrote: Any plans to implement such for music? I will look into it. I use Spotify as my only music source so ill round up some mp3's and get testing. If it looks easy ill probably just do it straight away. If it looks difficult i'll save it till i have some free time. UPDATE: I have made an automated client setup script that takes care of everything client side. 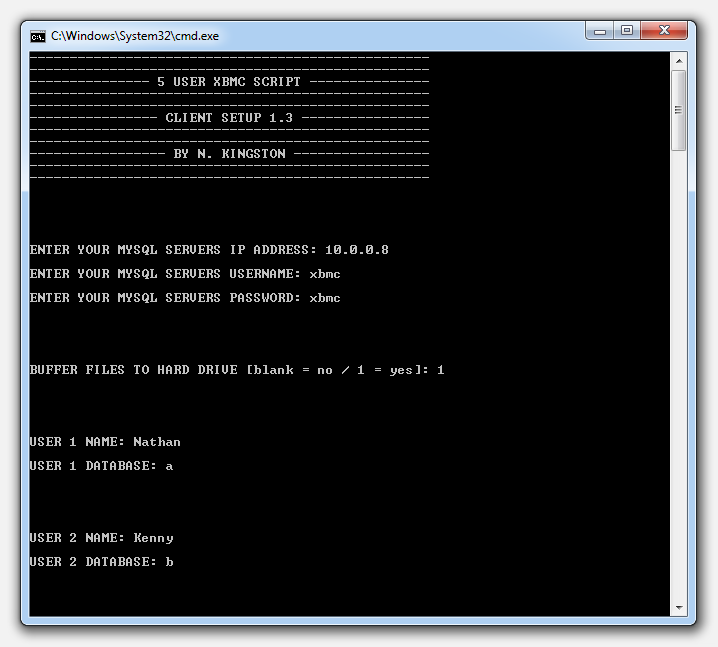 (2014-06-06, 06:08)deathraiider Wrote: UPDATE: I have made an automated client setup script that takes care of everything client side. Looks good but for Linux/OpenELEC users it will fail I guess, Windows only script? (2014-06-06, 08:12)schumi2004 Wrote: Looks good but for Linux/OpenELEC users it will fail I guess, Windows only script? Its a .bat file that sets up various folders and files. I do plan to eventually support linux and mac. Also, i have your music database ready for testing. It renames the 'song' table to 'globalsong' and adds a place for b, c, d and e to store iTimesPlayed and lastplayed columns. Then links everything up. I noticed something that you could add as reminder for existing shared database users. Out of curiosity. Which method would performance wise be the best? Yours or from bakslash ? (2014-06-06, 11:18)schumi2004 Wrote: I noticed something that you could add as reminder for existing shared database users. That would be something covered in the setup of the MySQL server. But most people will probably be running an XBMC only MySQL server that either just uses a root account, or an account named xbmc with full privileges. Unless using a shared MySQL server there is no real need to secure it properly. I will eventually document the setup procedure of my whole setup including proxy/webcache and will include a section on MySQL permissions. (2014-06-06, 11:18)schumi2004 Wrote: Out of curiosity. Which method would performance wise be the best? Yours or from bakslash ? Umm, i'm not too sure as i have only briefly used other methods. I only use tables and views so it should be as fast as it gets. Also this method does not store any duplicate data. Its essential that you add "skip-name-resolve" to your my.cnf config file if you have not already. It makes a huge difference. Im quite confident that it is the most complete and problem free setup. I would go out on a limb and say that its a 100% perfect SQL structure as i have been using it for some time now with zero problems. I work with SQL databases as part of my job on a regular basis so i have more experience in SQL then most.